Are you ready for a journey with God? “It’s time to go!” It’s time to move somewhere new.” These words sound good to those trapped or enslaved, but we may resist change because we prefer our present surroundings to a new, unknown environment. But what if God gives the order to move? Will we follow his lead? Exodus describes a series of God’s calls and the responses of his people. Exodus is the great book of deliverance, of salvation, and of redemption. Exodus clearly pictures and proclaims that God: delivers us, saves us and redeems us. God’s great deliverance is pictured for us in the experiences of Israel. Israel was a new people created by God in ages past to be His witnesses, the people of God who were to bear witness to the only living and true God. Throughout Exodus, it is helpful to remember this fact: Israel was a whole new race of people, a race created by God to carry on the godly line of believers and eventually to bear the promised seed, the Savior of the world. What had happened was this. From the very beginning of human history, man had sinned and brought death upon the human race. But to counteract sin and death, God had promised to send a Savior (the promised seed) through the godly line of Adam and his son Seth. Time and again God had to intervene to keep the godly line of believers pure. This He did right up to The Great Flood. At that time God chose Noah, and later the line of his son Shem, to carry on the godly line of people. God kept His promise and kept the hope of the promised seed and Savior alive. But even after The Great Flood, the human race, just as it had always done, continued to try to be their own god and do things their way, not God’s. Therefore God had to once again intervene in human history. This He did by calling Abraham to father a whole new race of people, a people who were to carry on the godly line and give birth to the promised seed and Savior of the world, the Lord Jesus Christ. As stated, Israel was a whole new race of people, the descendants of Abraham. God had created Israel to carry on the godly line of believers and to eventually bear the promised seed, the Savior and Messiah of the world. The first great Book of the Bible, Genesis, covered the birth and early beginnings of Israel. The second great Book of the Bible, Exodus, begins with Israel (God’s People) in Egypt. Remember that Egypt is a picture, a type, a symbol of worldliness. Egypt was a society that had reached the summit of prosperity, technology, and pleasure; but the people had rejected the only living and true God (Jehovah) and created their own gods to follow. Israel, the new race of people who believed in the true God, sat right in the middle of Egypt; and Egypt was oppressing and enslaving Israel. The people of God were being persecuted by the world. Israel needed God’s help. The people who believed in the true God (true believers) needed God to intervene on their behalf. The believers of that day needed God to deliver them from the persecution and oppression of the Egyptians. The subject of Exodus is our great need for deliverance, salvation, and redemption. Exodus has been called the sequel to Genesis. Four hundred years had passed since Joseph moved his family to Egypt. These descendants of Abraham had now grown to over two million strong. To Egypt’s new pharaoh, the Hebrews were foreigners, and their numbers were frightening. Pharaoh decided to make them slaves so they wouldn’t upset his balance of power. As it turned out, that was his biggest mistake, for God then came to the rescue of his people. Through a series of strange events, a Hebrew boy named Moses became a prince in Pharaoh’s palace and then an outcast in a wilderness land. God visited Moses in the mysterious flames of a burning bush, and, after some discussion, Moses agreed to return to Egypt to lead God’s people out of slavery. Pharaoh was confronted, and through a cycle of plagues and promises made and broken, Israel was torn from his grasp. It should be noted that after God prepared Moses to deliver his people, He sent him back to Egypt after forty years. Moses is to assemble elders of Israel and go to Pharaoh. Pharaoh will refuse to let Israel go. His refusal will open the contest between God and the gods of Egypt. Egypt was dominated by idolatry — “gods many and lords many.” There were thousands of temples and millions of idols. Behind idolatry is Satan. There was power in the religion of Egypt. As God performed miracles through Moses, the sorcerers and magicians in Egypt were able to somewhat duplicate these acts through satanic methods. Pharaoh asked, “…Who is the Lord, that I should obey his voice to let Israel go? I know not the Lord, neither will I let Israel go” (Exod. 5:2). God introduced Himself. Pharaoh got acquainted with God and acknowledged Him as God. “And Pharaoh sent, and called for Moses and Aaron, and said unto them, I have sinned this time: the Lord is righteous, and I and my people are wicked” (Exod. 9:27). A question arises from this book: Why the plagues? They were God’s demonstration of power over the gods of Egypt. Each plague was directed against a particular god in Egypt. “For I will pass through the land of Egypt this night, and will smite all the firstborn in the land of Egypt, both man and beast; and against all the gods of Egypt I will execute judgment: I am the Lord” (Exod. 12:12). God wanted to reveal to His own people that He, the Lord, was far greater than any god of Egypt and that He had power to deliver them. God led Moses and the nation of Israel, and he wants to lead us as well. Is he preparing us, like Moses, for a specific task? He will be with us; let’s obey and follow. Is he delivering us from an enemy or a temptation? Trust him, and do what he says. Have you heard his clear moral directions? Read, study, and obey his Word. Is he calling you to true worship? Discover God’s presence in your life, in your home, and in the body of assembled believers. 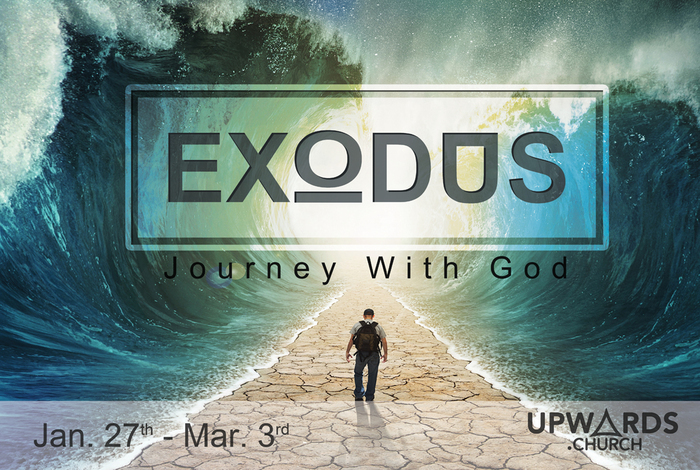 Exodus is the exciting story of God’s guidance. Let’s learn it with the determination to follow God wherever he leads. I hope you can join us this weekend and journey with God! Sources: The Preacher’s Outline & Sermon Bible – Exodus I, (Chattanooga: Leadership Ministries Worldwide, 1996), WORDsearch CROSS e-book, Under: “I. ISRAEL AND EGYPT: THE OPPRESSION OF GOD’S PEOPLE BY A NATION THAT HAD REJECTED GOD, 1:1-22”. Vernon McGee, Thru The Bible with J. Vernon McGee, (Nashville, TN: Thomas Nelson, 1983), WORDsearch CROSS e-book, Under: “EXODUS”. Life Application Study Bible, (Wheaton, IL: Tyndale, 1988), WORDsearch CROSS e-book, 94. This entry was posted in Journey with God - Exodus and tagged deliverance, Egypt, Exodus, Journey with God, redemption, slavery, Upwards Church. Bookmark the permalink.